This easy chia oats take about 60 seconds to prep and make a great base for any toppings you choose. I went with a classic blueberry and banana combo but other options include your choice of fresh fruit such as peaches, raspberries or strawberries, chopped nuts, chopped dates, cacao nibs, almond butter or coconut. Put the oats, chia seeds and almond milk (and cinnamon and sea salt if you using) into an air-tight container and store in the refrigerator overnight. Make sure to mix well so there are no clumps. 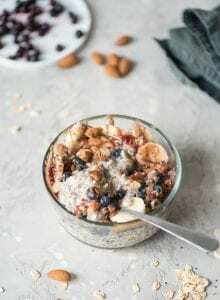 In the morning, top the overnight oats with the sliced banana and blueberries and add any other optional toppings you desire such as chopped dates, nuts, seeds, cacao nibs, coconut or extra fruit. If you prefer, you can add everything to the container the night before so they’re ready to grab and go in the morning. Both ways are yummy! Optional topping suggestions (choose 1 or 2): 1 tbsp almond butter or tahini, a few chopped almonds or walnuts, 1 tbsp sugar-free jam, cacao nibs, coconut flakes, goji berries, sunflower or pumpkin seeds, fresh raspberries or strawberries.